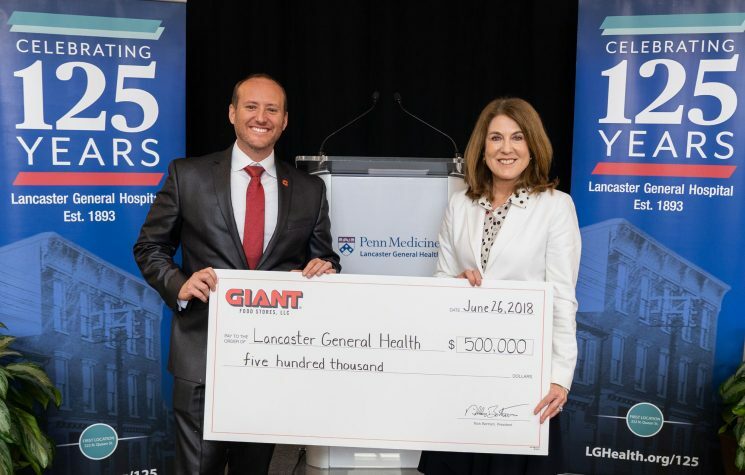 June 26 – Lancaster, PA – Penn Medicine Lancaster General Health and GIANT Food Stores have announced a $500,000 gift to the new Pediatric Inpatient Center at Lancaster General Hospital. The Pediatric Inpatient Center, which will be located in the hospital’s new Frederick Building, will offer state-of-the-art design, technology and programs in a child- and family-centered environment. Construction will begin this fall, with a planned summer 2019 opening. “Lancaster General Hospital marks its 125th anniversary this year, and almost from the very beginning, caring for children has been part of our mission,” Bergen said. “This tradition will now continue well into the future in our new Frederick Building.” Each year LG Health treats more than 1,500 children as inpatients and 19,000 children in the Emergency Department. The new Pediatric Inpatient Center will be more than double the size of the current pediatrics unit. New programs will include certified pediatric health-care professionals to support children and families throughout their hospital stay.